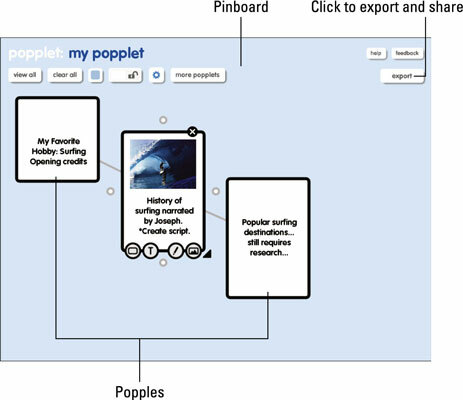 Students can storyboard their multimedia assignments using the iPad education app, Popplet Lite. 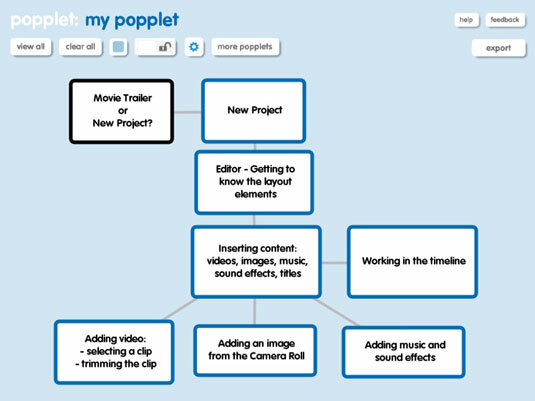 The best multimedia projects are planned, and creating a Popplet Lite storyboard with that clearly lays out all the steps or scenes is a good way of achieving that. A storyboard is a form of flowchart that visually maps out how to progress from one step to the next in a project. Each step can also include the relevant details, images, links, and text. One popular iPad app that lets you map your ideas visually is Popplet Lite, which also comes in a paid version called Popplet. It has a simple interface that enables you to create and place notes called Popples on a board. Add content to your notes and move them around so they connect to other Popples and form relationships. Meet the Pinboard. When you first open Popplet, it presents a blank area called the Pinboard. You create your visual map by placing Popples on the Pinboard. Place some Popples. Double-tap anywhere on the Pinboard to place a Popple, which is a digital note. Grab the corner to resize it, and tap the Popple itself to move it around on the Pinboard. Add content such as images, text, or a freehand drawing to it by tapping any of the icons on the bottom. You can even take a live photo with your camera! Connect the dots! Did you notice that each Popple had a little circle on each side of it? Go ahead: Tap it and drag the little circle to a new location. A new Popple is automatically created with a line connecting the two of them. Pretty easy, wasn’t it? You can also double-tap the Pinboard to create a new Popple and then pull out a line between it and another Popple to make a connection. Keep going as far as you want. If you’re putting a lot of information into your Popples, you’ll run out of room on your iPad screen pretty quickly. Just place your finger anywhere on the Pinboard and slide it out toward the edge to get additional space. The existing Popples slide out the side of the screen as you get more space for new ones. If you start to feel insecure and need to see all your Popples at once, tap the View All button on the top of the Pinboard. Have faith: They’re all still there! Share from Popplet Lite. Tap the Export button in the top-right corner when you’re done. If you’re using the Lite version, you can e-mail your work as a PDF document or a JPG image. If you purchased the full version, you have additional options to collaborate with other users, share Popplets online, and more. This is a visual world. Many things that can be written can also be mapped visually. Popplet is a great tool for creating storyboards. It’s also a great tool for a variety of other purposes, such as planning an essay or a screencast. You can also use it to map out a period of history, graph a family tree, demonstrate the relationships between factors that contribute to a scientific outcome, list resources for a course, map themes in a novel, show steps in a cooking recipe, and more. The more options you give learners for connecting with information, the more you can accommodate and differentiate between alternative learning preferences.